This entry was posted in bath and body fragrances, candle fragrance oils, Fragrance Oils, Natures Garden, soap fragrances and tagged beverage scents, body safe fragrance oil, cabernet sauvignon fragrance, cabernet sauvignon scent, candle making supplies, candlemaking supplies, cold process soap scents, easy scented markers recipe, fragrance oil, fragrance oils, fragranceoil, fragrances for cp soaps, fragrances for soy, free recipe, highly requested scents, how to make scented markers, make your own scented markers, natures garden, original fragrances, original scents, perfect pour scents, scents for cp soap, scents for soy wax, smells like wine, soap making supplies, soapmaking supplies, sweet scents, unique scents, vanilla white color stabilizer, wine scent on May 31, 2014 by Deborah Ward. 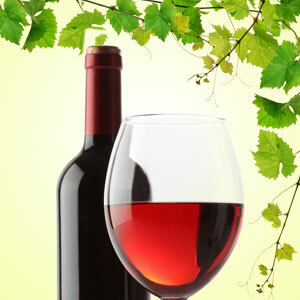 Cabernet Sauvignon has a long history that was first introduced in the year 1820. After decades of experimentation, the general view of Cabernet Sauvignon has improved as more winemakers find ways to complement their native grape varieties with Cabernet as a blending component. The grape itself is small with seeds, and has a thick black skin. It has a not too sweet grape flavor that is inviting and pleasurable. When it comes to this wine scent, our customers were astounded with the performance of Cabernet Sauvignon Wine Fragrance in their products. There is no strong “alcohol” scent and they are left with a wonderful grape aroma that is surprisingly delightful, full bodied, and completely high in demand when it comes to wine scents. What does Cabernet Sauvignon Wine Fragrance Oil smell like? This fragrance oil by Natures Garden is the sweet aroma of wild grapes enhanced with hints of strawberries and sweet sugary notes with a light alcoholic background. A wonderful aroma of red sweet cabernet wine. An NG Original Scent! How do our customers use Cabernet Sauvignon Fragrance Oil? For any candle crafters and home scenters, Cabernet Sauvignon Wine Fragrance Oil is used in WOW, Joy, Pillar of Bliss, and Soy waxes. The scent has very strong hot and cold throw, especially in soy and Joy waxes. This delightful wine scent is even used in oil burners, room fresheners, aroma beads, and smelly jellies. For any bath and body crafters, this fragrance oil offers uniqueness for your line. The usage rate for this wine scent is 3%. Cabernet Sauvignon does have a vanillin content is 6.5%, so Vanilla White Color Stabilizer is advised by our customers to stabilize discoloration in finished products. The most common products that customers use this wine scent to make are: spritz lotions, whipped body butters, bath bombs, salt scrubs, melt and pour soaps, and bath gels. Finally, for those of you that are cold process soapers, this fragrance oil is unmatched. Here are the official results: Perfect Pour, no ricing, no acceleration, discolors to a dark brown, but is totally worth it. If you are interested in a Natures Garden recipe using this wine scent, please click on this link to view the Scented Markers Recipe. This entry was posted in candle making supplies, cold process soap, Fragrance Oils, Natures Garden, Soap making supplies and tagged 16th Annual Alabama Soap Meeting, annual Alabama Soap Meeting, candle making supplies, candlemaking supplies, crafting conferences to attend, essential oils, fragrance oil, fragrance oils, fragranceoil, fun conferences to attend, handcrafted, handcrafted soapmakers and cosmetics guild, homemade crafters, knowledgeable seminars, natures garden, Natures Garden pre order, soap making supplies, soap meeting, soapmakers, soapmaking supplies on May 30, 2014 by Deborah Ward. 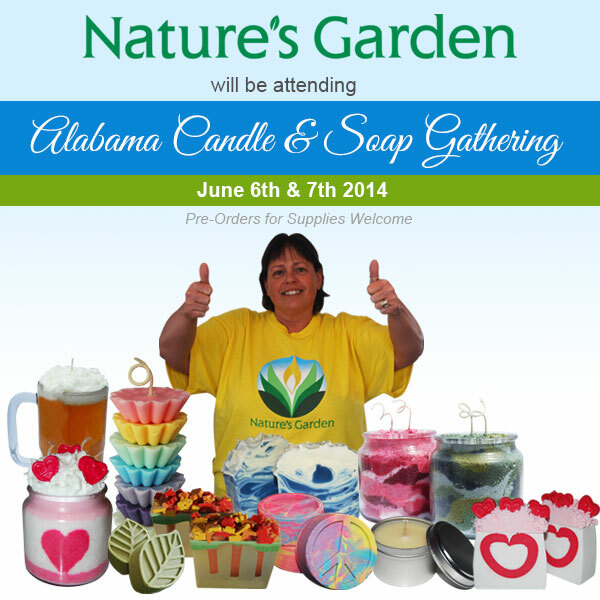 Another gathering is quickly approaching that Natures Garden will be attending; the 16th Annual Alabama Soap Meeting! Taking place from Friday, June 6th through Saturday, June 7th, this event has a jammed packed schedule of fun and informational classes. The Annual Alabama Soap Meeting will be yet another first for Natures Garden. The Natures Garden representative attending this year will be Cindy. She is once again super excited at the opportunity to meet even more of our wonderful customers in attendance, and many new faces! Held at the Doster Memorial Community Center in Prattville, Alabama; this event promises “fun, fellowship, food, education, and awesome shopping opportunities”. It really looks to be quite the amazingly planned event. So, if you are interested and willing to move quickly, you still have time to register. Ending May 31st, you will not only be able to meet Cindy, but you can have the opportunity to attend some amazing and informative classes covering quite the array of various market related topics. Besides all of the fun and knowledgeable festivities, you will also receive a goodie bag, and the chance to win numerous door prizes during the two day event. As per our usual vendor booth set up, Cindy will be bringing a sample of every fragrance oil that Natures Garden currently carries. So, once again, if you plan on attending, you will have the opportunity to sniff every different fragrance oil to your heart’s content. And, let’s not forget if you are there, stop by and say hello! 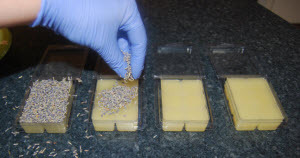 Natures Garden is currently taking pre orders if you are planning on attending the Annual Alabama Soap Meeting. Cindy will also be bringing the orders with her, so if you pre order, you can save on shipping. There is also a 5% discount if you act fast. Just make sure if you want to partake in this fabulous deal that when placing the order you write in the special comments section: I need this order delivered to the Alabama Gathering. Once this is established for your order, you will be credited for the shipping cost, as well as the 5% discount on your merchandise. This deal is effective through June 3rd. This entry was posted in candle making supplies, Fragrance Oils, Natures Garden, Soap making supplies, wholesale fragrance oils and tagged Annual HSCG Conference, candle making supplies, candlemaking supplies, crafting conferences to attend, essential oils, fragrance oil, fragrance oils, fragranceoil, fun conferences to attend, handcrafted, handcrafted soapmakers and cosmetics guild, handcrafters guild, helpful crafters, homemade crafters, HSCG 2014, HSCG 2015 Conference, knowledgeable seminars at the HSCG conference, loews resort, natures garden, soap making supplies, soapmakers, soapmaking supplies, the 2014 HSCG Conference, vendors booths at the HSCG conference, what happened at the HSCG conference on May 28, 2014 by Deborah Ward. Last week, Cindy and I attended the HSCG 2014 Conference in Tucson, Arizona. Spoiler alert… we had a blast! At first, Cindy and I did not know what to expect. This was our very first time attending an HSCG Conference. We were nervous and excited at the same time. It was going to be such a treat to meet our customers and other soapmakers and crafters. Upon our arrival to the breath taking Loews Resort (where the conference was held) we quickly wanted to get our vendor booth set up and functional. Since we brought a sample of each of the 816 fragrance oils that Natures Garden currently carries, we knew getting them unpacked and displayed was going to truly be a feat. Walking into the conference area was inspiring, there was quite an array of other vendors also setting up and preparing for the conference. 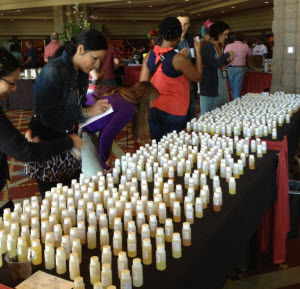 Briskly walking past the displays, it was very easy to see that there was going to be something there for every attendee from fragrances to essential oils, unscented bases, educational books, supplies, and packaging; just to name a few. Once we settled into our area, we quickly started to unpack and set up our displays. People were already starting to register in the lobby and it was very easy to see everyone’s excitement for the conference to officially begin. There was most definitely a contagious thrill mounting in the air. As for the Natures Garden booth; we did bring a few other products for our booth, but the main focus was the fragrance samples. 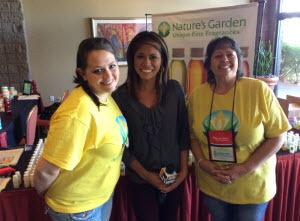 We saw the HSCG Conference as a chance to let people smell fragrances that they always wondered about. And boy, let me tell you the attendees were ecstatic over the scents. It was very energizing to see the excitement as people sniffed away and asked questions. It was very easy to see from the first night that this conference was going to be a huge success. The charisma and vigor that all of the attendees, staff, vendors, and guild members had was inspiring. Everyone was so very genuine and nice; not only to us, but amongst each other as well. And, it was so very nice to see many of the experienced soap crafters giving advice, sharing tricks of the trade, and helping those that were either just starting out or thinking about extending their lines. During the conference, the days were chucked full of educational classes, gourmet meals, meet and greet opportunities, and good times. Every time a seminar let out, the vendors area would fill with attendees discussing everything they learned, the great experience they had, and the plethora of knowledge they attained. All in all by the time that Friday morning hit (the last day), the conference was a buzz with all of the happiness of a well planned and informative week. The Handcrafted Soapmakers and Cosmetics Guild had yet another successful conference year. Everyone had a super fun time, learned a lot, and met such a variety of new and creative crafters. All in all, attending the conference was so well worth it. Next year the HSCG 2015 Conference will be held in Indianapolis, Indiana from April 18th – 20th. Our suggestion for anyone that is on the fence about going is that attending this conference is highly recommended from these two first year conference attendees. Not only will your days be filled with knowledgeable seminars and your evenings with fun get togethers, but you will meet some of the nicest and most helpful fellow crafters in the industry. On a final note: A special thank you goes out to all of the hard work that the members and staff of the Handcrafted Soapmakers and Cosmetics Guild did. For us, this year’s conference was a huge success. We met new people, had tons of fun, many laughs, and truly enjoyed our time at the conference. This entry was posted in bath products, candle making supplies, Fragrance Oils, Natures Garden, Soap making supplies and tagged body safe fragrance oil, candle making supplies, candlemaking supplies, do it yourself, feminine fragrance, feminine scent, floral fragrance oil, floral scent, flower fragrance, flower scent, fragrance body oil, fragrance oil, fragrance oils, fragranceoil, fragrant aroma, free recipes, garden scent, good scent throw, homemade, homemade soap, house smell good, hydrangea fragrance, hydrangea scent, lovely fragrance, lovely scent, lye soap, natures garden, scents for aroma beads, soap making supplies, soap scent, soapmaking supplies, spray lotion scent, spring scent, summer scent on May 28, 2014 by Deborah Ward. Hydrangeas are one of the most beautiful and vibrant flowers out there. To some, they can be hard to grow, but to the masters, they become a work of art. They are mainly found in southern and eastern Asia and come in 6 different colors varying from reds, to purples, to blues and whites. They resemble in some fashion to a giant carnation with several little petals that make up the large pom pom tops to display these colors like no other. And they have the loveliest of floral scents. There are nearly 75 different species of hydrangeas and they can grow upwards of 98 feet tall. With a beautiful floral scent this fragrance oil is not overpowering. It is a fabulous addition to any home that loves the floral scent Hydrangea Heaven has to offer. So even if you can’t grow this amazing flower, you can still reap the benefits of it glorious scent. In fact, this flower scent is a great addition to scent your floral product line! What does Hydrangea Heaven Fragrance Oil smell like? How do our customers use Hydrangea Heaven Fragrance Oil? For candle crafters and home scenters this flower scent is a huge hit. Our customers use this floral fragrance in their soy tarts, tea lights, Palm Container wax, WOW wax, gel wax, Joy wax, and soy. This soft, inviting scent has a great hot or cold throw. As for other home scenting ideas; Hydrangea Heaven Fragrance Oil has been used in oil diffusers, electric burners, and aroma beads. 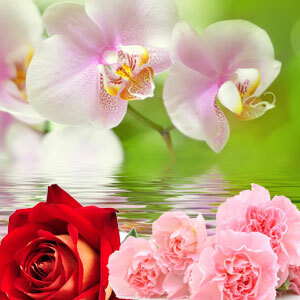 On the bath and body end of products, the usage rate for this flower scent is 5%. It is used to scent: melt and pour soaps, bath bombs, shampoo, shower gel, body sprays, lotions, and body butters. All with a nice long lasting scent. And, for those of you that are cold process soapers, this flower scent is strong. Here are the official results: Slight acceleration due to floral notes, no ricing, no discoloration, nice strong scent. If you are interested in a unique Natures Garden recipe using this flower scent, please click on this link to view the Hydrangea Candle Recipe. This entry was posted in candle fragrance oils, cold process soap, Fragrance Oils, Natures Garden, Soap making supplies and tagged bath and body scents, body oils, body safe fragrance oil, candle making supplies, candlemaking supplies, clean fragrance, clean scent, feminine fragrance, floral fragrance, floral scent, fragrance oil, fragrance oils, fragranceoil, home scenting, homemade, homemade soap, house smell good, natures garden, outdoorsy scents, perfume scents, renewing scent, scents for candles, scents with good cold throw, scents with good hot throw, soap making supplies, soapmaking supplies, spring fragrance, spring scent on May 24, 2014 by Deborah Ward. As spring awakens outside, the world around us becomes alive and thriving with new life. Everything begins to grow, and spring rains are abundant. In fact, is often believed that spring rains are necessary to wash away the old and make way for all things new. And, with spring rains the air seems fresher. The renewing scent of spring rain fragrance oil is just that; a breath of fresh air. With the scent of fresh vibrant flowers tickled with musk, this is one pleasing fragrance. Spring Rain Fragrance Oil has always been at the top of the list for our customers. It is such a lovely floral scent that even the men love it. Definitely an NG Best Seller! What does Spring Rain Fragrance Oil smell like? This fragrance oil by Natures Garden is a musky accord enhanced with a fresh floral bouquet of carnations, tiger lilies, alyssum, orchids, and roses, with hints of fresh greenery. A Best Seller! How do our customers use Spring Rain Fragrance Oil? For candle crafters and home scenters this renewing scent is a huge hit. Our customers use the scent of spring rain in their soy tarts, tea lights, Palm Container wax, WOW wax, gel wax, and Joy wax. This soft feminine scent has great hot and cold throw too, definitely making your house smell good. As for other home scenting ideas; this renewing scent has been used in diffusers, oil burners, wax dipped animals, and room refreshing sprays. On the bath and body end of products this renewing scent is captivating. 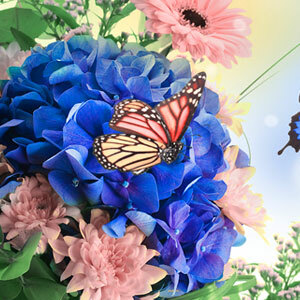 The usage rate for Spring Rain fragrance oil is 5%. And, is used to make: melt and pour soaps, bath bombs, shampoos, shower gels, body sprays, lotions, and body butters with a nice and feminine long lasting scent. For those of you that are cold process soapers, this renewing scent soaped beautifully. Here are the official results: Perfect Pour. No ricing, no acceleration, no separation. This scent is a nice and clean one. Very refreshing! No discoloration. This entry was posted in bath and body, candle fragrance oils, Fragrance Oils, Natures Garden, Soap making supplies and tagged bakery aroma, bakery scent, best selling scents, candle making supplies, candlemaking supplies, cold process soap scents, cookie fragrance, cookie scent, fragrance diffuser oil, fragrance oil, fragrance oils, fragranceoil, great food scent, homemade, natures garden, oil diffuser scents, peanut butter cookie fragrance, peanut butter cookie scent, realistic scent, scents for making candles, scents that have strong throw, scents that smell like food, scents to make your home smell good, smells like fresh baked cookies, soap making, soap making supplies, soap scents, soapmaking, yummy scents on May 24, 2014 by Deborah Ward. The peanut butter cookie was invented by a gentlemen named George Washington Carver. In fact, George came up with over 103 recipes that included peanuts. The first peanut butter cookie was rolled thin and cut into shapes, just like your sugar cookies of today. Eventually by the 1930’s they were “dropped” into balls and pressed with fork tines in a crisscross pattern. Technically, there was no real reason for this additional step but it became the style peanut butter cookies became known for. And, just like a freshly baked platter of peanut butter cookies, there is no denying the authentic aroma of this cookie scent. It is so unbelievably real you may just think somebody baked a large batch of cookies. This cookie scent is comforting, inviting, and so yummy; leaving quite the impression. Peanut Butter Cookie Fragrance Oil is a very true scent to the real cookie. What does Peanut Butter Cookie Fragrance Oil smell like? This fragrance oil by Natures Garden is simply amazing! 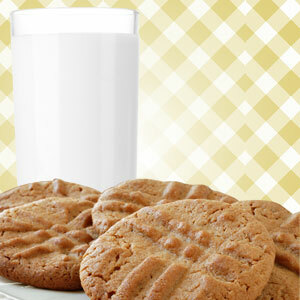 Peanut Butter Cookie fragrance is a rich, buttery, freshly baked aroma of real peanut butter cookies! You will not believe how true to name this scent is! A Best Seller! How do our customers use Peanut Butter Cookie Fragrance Oil? For candle crafters and home scenters this bakery delight is a huge hit. Our customers use this cookie scent in their soy tarts, tea lights, Palm Container wax, WOW wax, Joy wax, and soy. And, Peanut Butter Cookie Fragrance Oil has great throw too. As for other home scenting ideas; this scent has been used in oil diffusers and electric burners. On the bath and body end of products, the usage rate for this fragrance oil is 5%. This cookie scent does contain a vanillin content of 1.6%, so using Vanilla White Color Stabilizer is highly recommended to offset discoloration in your finished products. This wonderful cookie scent is used to make: melt and pour soaps, bath bombs, lotions, and body butters; all with a delicious buttery scent. And, for those of you that are cold process soapers, this cookie scent soaped beautifully. Here are the official results: No acceleration at all. Scent sticks. Soaps great. Discolors to a caramel color. This entry was posted in candle fragrance oils, cold process soap, Fragrance Oils, Natures Garden, soap fragrances and tagged beautiful fragrance, beautiful scent, best soap scents, body oil, body safe fragrance oil, candle making supplies, candlemaking supplies, cold process soap scents, feminine fragrance, feminine scent, floral scent, fragrance oil, fragrance oils, fragranceoil, homemade soap, lye soap, natures garden, queen of the nile fragrance, queen of the nile scent, royal fragrance, royal scent, scents for soap, scents with good cold throw, scents with good hot throw, scents with good throw, soap making scents, soap making supplies, soap scent, soapmaking supplies on May 23, 2014 by Deborah Ward. Cleopatra who was the Queen of the Nile, was the last acting pharaoh of ancient Egypt. She was very powerful and knew exactly what she desired. She had many conquests that included the most powerful of men, such as Caesar and Marc Antony who could not escape her sexual and aesthetic appeal. But it wasn’t just them, her subjects were also awed with her immaculate beauty. 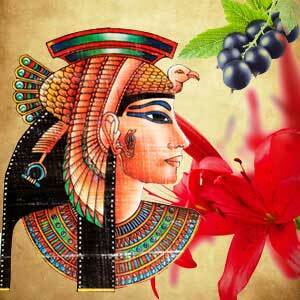 Queen of the Nile Fragrance Oil holds true to the alluring Cleopatra. This exotic and royal scent is so lovely that the attraction is effortless before you too are conquered. And when it comes to this royal scent in homemade products, it is by far one of NG’s favorite feminine fragrances. What does Queen of the Nile Fragrance Oil smell like? Exotic and fragrant, this fragrance oil by Natures Garden is a glorious night blooming lily which exudes notes of a sensuous floral musk paired with cassis and ripe berries. How do our customers use Queen of the Nile Fragrance Oil? For all of you candle crafters out there; Queen of the Nile Fragrance Oil is used in Soy, soy blends, paraffin, WOW, Joy, and Pillar of Bliss waxes. This royal scent is very aromatic and has fabulous hot and cold scent throw. But, it doesn’t stop there! Queen of the Nile fragrance oil also works very well for room fresheners; whether it is oil burners, smelly jellies, or sachet beads. For bath and body end of things, this royal scent is a dominating one! The usage rate for this fragrance oil is 5% and does contain a .68% vanillin content. However, our testing of this fragrance showed no discoloration in soap; therefore use your own discretion as to whether or not to add Vanilla White Color Stabilizer. This amazing and feminine fragrance is used to scent: solid lotion bars, bath bombs, body sprays, spray lotions, perfumes, melt and pour soaps, body scrubs, bath gels, whipped body butters, and salt bars. Finally, for those of you that are cold process soapers, this fragrance is awesome. Here are the official results:Very slight acceleration. No separation. A good scent, pretty and feminine. No discoloration. 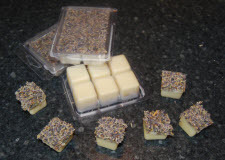 If you are interested in a Natures Garden recipe using this royal scent, please click on this link to view the Cleopatra Heavy Cream Cold Process Soap Recipe. This entry was posted in bath and body, bath products, beeswax, Fragrance Oils, Natures Garden and tagged bath melt packaging, bath melt recipe, bath melts with herbs, butters and oils list, candle making supplies, candlemaking supplies, clamshell bath melt, do it yourself, easy to make bath melt, fragrance oil, fragrance oils, fragranceoil, free recipe, herb list, homemade, how to use a bath melt, make your own bath melts, natures garden, pamper yourself, scent list, skin loving benefits, soap making supplies, soapmaking supplies, unique bath melts, what is a bath melt on May 22, 2014 by Deborah Ward. Now, you can make your very own homemade clamshell bath melt by following these very simple instructions. The clamshell bath melt takes no time to make, smells amazing, and comes complete in its own packaging. It literally does not get any easier than this recipe! All of the ingredients needed to make this super easy recipe can be found at Natures Garden. Now, besides all of the skin loving benefits of bath melts; one of the coolest aspects is that you can cater you bath melt to your specific liking. By switching out the scent, herb, oil, or butter, you can make an array of clamshell bath melts. If you would like to see the complete list of butters and oils you can choose from, please click on this link, or click on this link if you would like to see the herb selection. If you would like to view the variety of fragrances that Natures Garden carries, in finding the perfect scent for your clamshell bath melt, please click on this link. Just remember to select a scent that is body safe! 4 grams Kismet Fragrance Oil – A winner of a scent! This is the fragrance description: Beginning with fresh top notes of sweet orange and lavender; followed by a sleek woody blend of patchouli, incense and golden amber embracing the heart and soul inside oneself. Now, there are a few things that you will want to note about bath melts. First, if you are not fond of the idea of herbs going down your drain, you can always place the bath melts inside a pull string tea bag. This will still allow the bath melt to function, but will keep all of the herbs inside. Then, when you are ready simply throw the tea bag (with the herbs inside) away. Secondly, it is the nature of bath melts to begin to melt just from physical contact with skin (or warm water). It is not advised to keep your melts where they are susceptible to heat or direct sunlight, or to ship this type of bath and body product. First and foremost, as always clean and sanitize your work area. 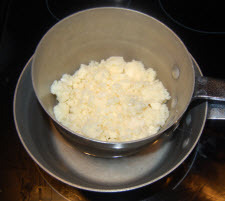 Then, using the double boiler method, weigh out and melt the following ingredients: the Mango Butter, the Grapeseed Oil, and the Beeswax. Once you see that all the ingredients are melted, remove them from the heat source. Next, add the Kismet Fragrance Oil. Then, stir to incorporate. Now, lay out your 4 clamshell containers on a flat surface. Then, slowly begin to pour the bath melt mixture into your clamshells. Do not fill the clamshells all the way full. Make sure you leave room for the lavender flowers to go on top. 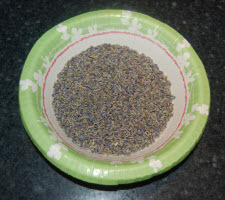 Next, weigh out the 10 grams of lavender flowers. 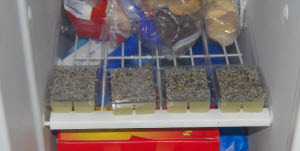 Once you notice that the bath melts have started to set up slightly, there will be a thin film. At this point, it is time to sprinkle the clamshells with the lavender flowers. Because the lavender flowers are so light, you may have to apply light pressure to ensure they stick to the top of the bath melt. When the clamshell bath melts are hard enough to move, place them in the freezer for 30 minutes. That is it! Remove your clamshell bath melts from the freezer, and snap the lid shut. When you are ready to use them: Only one bath melt is needed per bath. Place one bath melt cube into the bath tub under warm running water. Enjoy! Please Note: Be Careful: Your bath tub will be slippery from the oils and butters once the bath melt has melted. This entry was posted in candle fragrance oils, Fragrance Oils, Natures Garden, soap fragrances, zodiac scents and tagged body safe fragrance oils, candle making scents, candle making supplies, candle scents, candlemaking supplies, cold process soap scents, creative spin on fragrances, creative spin on scents, fascinating scents, fragrance notes for geminis, fragrance oil, fragrance oils, fragrance oils for gemini, fragranceoil, Gemini fragrance oils, Gemini personality traits, gemini scents, happy birthday gemini, homemade, marketing ideas, natures garden, scents for gemini, soap making scents, soap making supplies, soap scents, soapmaking supplies, what do geminis like, zodiac signs and scents on May 21, 2014 by Deborah Ward. Once again, it is that time to officially change the zodiac sign! This year we wanted to do something a bit different. So, for a little fun, we thought of researching exactly what fragrances appeal to people under a particular zodiac sign. And, what we found in our search was what aromatic notes most likely correspond with certain astrological signs. These fragrance oil suggestions contain aromatic notes that a person born under a specific Zodiac sign will like based on their common personality traits. Beginning May 21st, Geminis energetically become the driving force in the spotlight. So, we at Natures Garden would like to be the first to announce, Happy Birthday Gemini! And then cordially invite everyone to the fascinating world of Gemini scents. 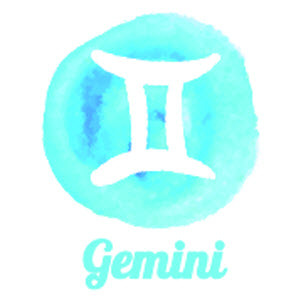 Geminis are considered people born between the dates of May 21st and June 21st. Sadly, we currently do not have anyone working at Natures Garden that is a Gemini. However, we have friends and family that are Geminis. They are a fun loving crowd that love to talk. Being that they are highly intellectual, geminis are constantly questioning and are forever thirsting for knowledge. And, dueled with their intellect, they are also vastly creative. Since geminis balance a life of inquisitiveness and wisdom they are often the life of a social gathering and really know how to work a room. But, on the flip side; geminis can also be great listeners who can tap into their library of information and experience and offer sound advice. This intellectual group is not only polite and energetic, but also adaptable to any situation. Dueling both a chatty side and a sympathetic ear, people with this sign need diversity. Gemini’s have a true admiration for fragrance oils that present a contrast but still manage to come together to make a beautiful aroma. This entry was posted in bath and body, candle making supplies, Fragrance Oils, Natures Garden, Soap making supplies and tagged body safe fragrance oils, candle making supplies, cold process soap scents, cosmetic fragrances, fragrance oil, fragrance oils, fragranceoil, fragrances with good scent throw, fruity fragrance, fruity scent, good tropical scents, natures garden, pina colada fragrance, pina colada scent, scents for bath and body, scents that work well, scents with strong throw, smells like hawaii, soap making supplies, tropical drink fragrance, tropical drink scent, tropical scents, where to buy fragrances on May 20, 2014 by Deborah Ward. The name Pina Colada actually means “strained pineapple.” Ricardo Gracia holds the first claim to inventing this fruity cocktail. In the process of perfecting his drink first called Coco Loco which consisted of coconut milk, rum, and coconut cream, he ran into an issue. Due to the fact that his drink was served inside a half a coconut, when the coconut supply was hit with a union strike, Ricardo decided to improvise. He used a hollowed out pineapple instead. The mixture of all these flavors topped off with the sweet acidic pineapple was a huge hit, and hence the Pina Colada was born. Natures Garden has captured the essence of the famous Pina Colada in this tropical drink scent. A grand mixture of the classic tropical aromas including coconuts and pineapples, it absolutely smells phenomenal in finished products. And, this scent will surely leave your customers salivating. What does Pina Colada Fragrance Oil smell like? This fragrance oil by Natures Garden is a tropical combination of sweet pineapple and coconut. 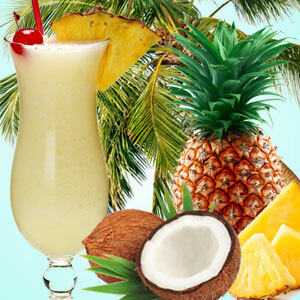 How do our customers use Pina Colada Fragrance Oil? For candle crafters and home scenters; this tropical drink scent is used to make pina colada candles using Joy wax, WOW wax, and in Soy wax; with a scent that seems to last forever! As for other home scenting ideas; Pina Colada fragrance oil has been used to make room sprays, aroma beads, and works fabulously for electric oil burners. On the bath and body end of products, the usage rate for this fragrance oil is 5%. This tropical drink scent does have a vanillin content of .5%, so vanilla white color stabilizer is highly recommended to offset discoloration in the finished homemade items. This wonderful tropical drink scent is used to make: bath bombs, handmade lotions, body sprays, sugar scrubs, body butters and body balms. For those of you that are cold process soapers, this fragrance soaps like a dream. Here are the official results: Works great in cp soap! No acceleration, no ricing, no separation. Very slight discoloration. Mild scent retention.